Here's a burro load of soups inspired by the Mexican culture, ingredients and zazzy spirit. I once thought that if it was Mexican it had to be hotter than a firecracker. Not so. Although they do have their sizzlin' hot soup recipes there are just as many that burst with Mexican flavor without setting a single tastebud on fire. Have you ever bought one of those BBQed or rotisseried chickens? We've included our recipe for making a rich, flavorful chicken stock from the carcass of those chickens. It's a wonderful starter to many of the recipes published here. Scroll through our selection of delicious recipes below and click on the picture and you'll go straight to the recipe. This is what I call my Mexican chicken stock recipe. It's a boat recipe I often use when we're planning to be in transit for a few days. Cooking can be a challenge when we're at sea so making preparations ahead makes it easier to have hot meals when things get a little lively. Use this stock for any recipe on this page that calls for chicken stock or broth. A rich and tasty version of Mexico's tortilla soup. Here's a dish that's interesting enough to serve to company and nourishing enough for family theme night. This soup is absolutely loaded with goodness and it looks as good as it tastes. Tomatoes, chicken, poblano chile, corn, beans and cilantro; a fiesta in a bowl. This taco soup recipe may be a party in a bowl but it's seriously nutritious too! 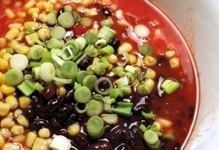 A mouthwatering taco soup that begins with a tomatoey broth and incorporates colorful black beans, corn and green onions to make a rich and filling soup that's a fun dish for entertaining and delicious enough that you won't have to hover over the kids to get them to eat. 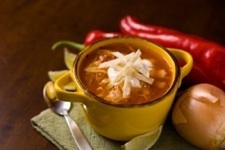 Do YOU have a Fantastic Mexican Soup Recipe? There are thousands of ways to make fantastic Mexican inspired soups. Share your favorite recipe with readers here and it will turn into a web page on our site that you can send your friends and relatives to. 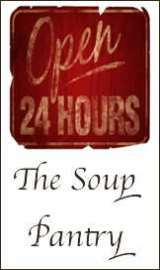 Are people always asking for your soup recipe? Post it here and you'll have your own web page with the recipe on it, just give them the address of the page instead of writing the recipe out each time you want to share it. You can even put your page address on facebook or in an e-mail to give all your friends and relatives access to your recipe. It's super easy... just start typing. Tell us about where you got the recipe, what you like about it, any alterations you've made... then enter the recipe.